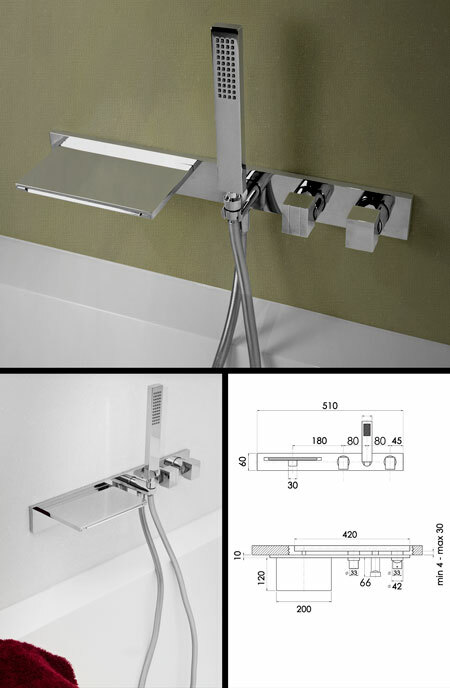 The Waterblade bath filler tap is designed and manufactured in Italy and shows high quality styling and manufacture. The stylish 200mm wide waterfall wall spout is operated via a single mixer tap, with a diverting lever to switch the water flow from the bath spout to a handy hand held shower attachment. The Waterblade bath filler is part of a full collection of matching designer bathroom fittings. * Part of larger collection. * Made of low lead & zinc brass. * Gold and Nickel finishes available to special order. * Prices are ex Vat.